According to the Personal Consumption Deflator, inflation in November was almost nonexistent. In fact, inflation over the past year has been a mere 0.9%. That's less inflation than the Fed wants, and it's one reason the Fed has not already ended its QE3 bond purchases—presumably the Fed is concerned that inflation is "too low" and deflation is uncomfortably a risk. I've argued before why deflation is not really a risk or a significant concern, and this post adds another reason to the list: deflation is largely confined to the durable goods sector, and it's not the result of deflationary monetary policy. 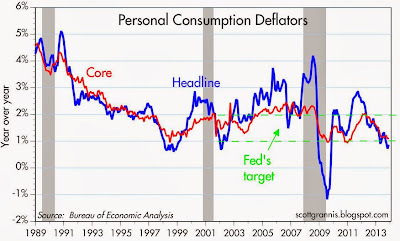 The first of the above two charts shows the year over year change in the headline and core measures of the Personal Consumption Deflator. 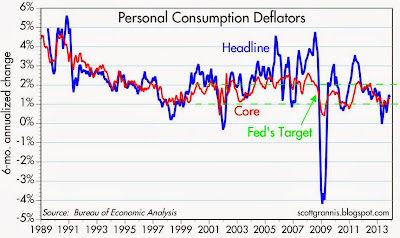 On a year over year basis, headline inflation has dipped to just below the Fed's desired target range. 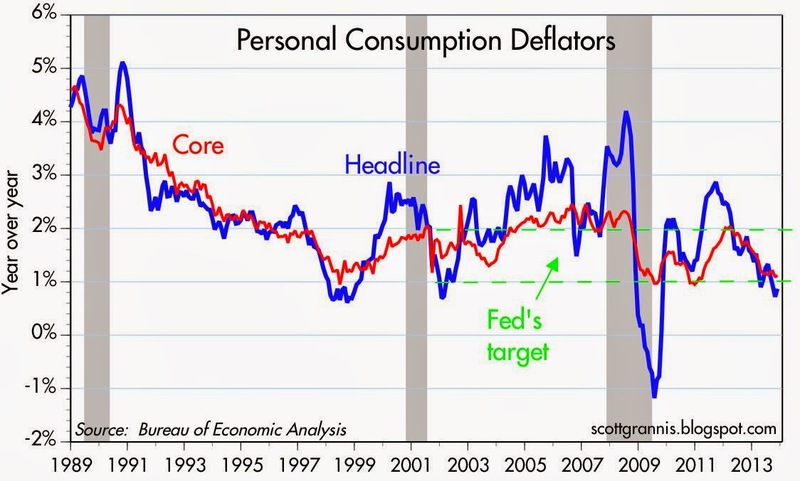 But as the second chart—which shows the 6-month annualized rate of inflation according to these same two measures—shows, inflation on a more coincident basis is running at a 1.3% annual rate. That's pretty close to nirvana in my book. 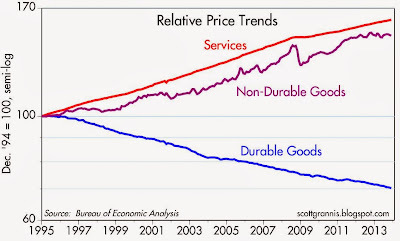 The above chart shows the major components of the Personal Consumption Deflator: services, durable goods, and non-durable goods. All three are indexed to 100 as of the end of 1994. I chose that date because it marked the beginning of what has now been an unprecedented, 18-year decline in durable goods prices. It's not a coincidence that that date also marked the beginning of the Chinese yuan's 18-year rise against the U.S. dollar, and China's export boom, which flooded the world with cheap manufactured goods. The early- to mid-1990s were also a time when computers began spreading like wildfire and the modern internet was born. 1995 was like the Continental Divide, when manufactured goods prices started going in one direction (down), while service sector and nondurable goods prices went in the other direction (up). The story is relatively simple: technology, coupled with the rise of China's manufacturing prowess, have driven down the prices of manufactured goods at the same time that they have boosted the productivity of labor. Labor is much more productive today, thanks to computers, technology, and the internet. So productive, in fact, that it takes less and less input from people to make more and better things. 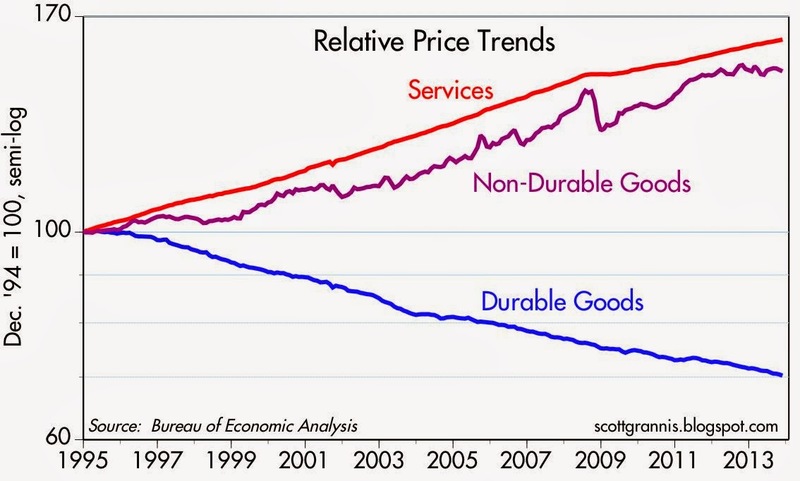 Durable goods prices have fallen by 30% in the past 18 years, while the prices of services (a reasonable proxy for labor costs) have risen by over 60%, and non-durable goods prices have increased by about 50%. Looked at another way, service-related prices have risen by almost 130% (i.e., they have more than doubled) relative to durable goods prices. This has led to the most amazing change in relative prices in modern times, and it's a gift that keeps on giving to the vast majority of the population: a typical wage today buys more than twice as much in the way of durable goods as it did 18 years ago, and there is no sign that this won't continue. 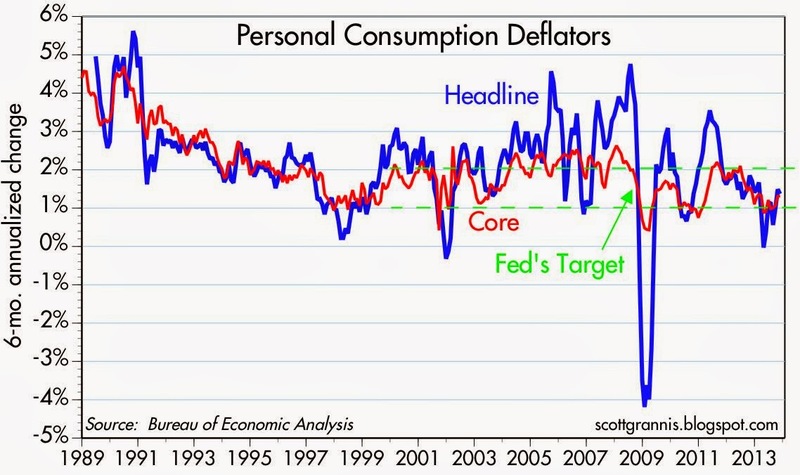 Most important fact of all: Monetary policy has had little if nothing to do with durable goods deflation. It's all about China opening up its billions of people to the global marketplace, the blossoming of international trade, and the technological wonders released by the combination of ever-more-powerfu computer chips and incredible software technology. This is not something to fear, this is something to celebrate. I like the news about declining prices in durable goods -- real working wages will follow that trend over the balance of the 21st century -- now is the time to buy dividend and rent-earning equities at bargain prices! Since the Fed went to open-ended, results dependent QE3, in Sept. 2012, the private sector has been adding jobs at 200k per month, the last quarter came in at 4 percent real growth while inflation dropped below 1 percent...and Scott Grannis wants to stop QE3? Why? Key to lower durable goods costs remaining on their downward slope going forward will be less China and more the relatively silent manufacturing revolution going on in North America with the amazing emergence of practical robotics and advanced manufacturing software/hardware. While not a great jobs story, this revolution (along with the North American energy story) is a key upward driving factor for the next 10+ years. On real wages in the manufacturing sector, the total wage component will hold steady or go down. However, the wage per worker will go up substantially given the technical knowledge needed to run the sophisticated software and machinery of state of the art manufacturing centers. By the way, companies are having a hard time finding appropriate candidates for these 6 figure (after 4-5 years) jobs! Scott wants to stop QE3 because he knows that the proper way to incentivize growth is through looser fiscal policy not looser monetary policy. IE: lower taxes not cheap money. William, agree with your comment in the unskilled and semi-skilled manufacturing areas. To the extent those jobs have not already gone off-shore or south, they will be in the future except in industries where they have to be here. However, in the skilled and automated areas, the re-shoring movement is here to stay. I have to pleasure to work with many companies involved in that movement in the Midwest, and the growth of integrated manufacturing platforms that use the incredible combinations of modern machine tools, robotics and manufacturing software is amazing. The people who run these cells are in incredible demand - they are the future of US manufacturing. Great to see these products coming back from China, often in the form of the higher skilled processes done in the US and the lower skilled in Mexico. Merry Christmas!